Discover five strategies from an autism specialist and author to help an ASD child develop self-esteem and a positive sense of self. Receive expert advice on how you can minimize stress and anxiety for a child with autism during this overwhelming time of the year. ​Be inspired by a teacher with autism who encourages people with special needs to reach for the stars and ask for support when needed. Find simple ways you can meet an ASD child at his/her level so you can better connect. ​Learn about the remarkable autism mom who led the legislation to establish JP’s Law in Virginia and established a special identification card that helps law enforcement understand when they are engaging with someone with special needs. Discover simple steps you can take to ensure a special needs student receives the education he/ she deserves. ​A loving mother shares the journey that led her to make the hardest choice of her life in an effort to keep her ASD son safe and allow him to be himself. Discover great ways to help a child with autism thrive in the classroom using special accommodations. ​Find out about some of the important topics discussed at the International Society for Autism Research Annual Meeting held in the Netherlands. ​Learn how using an applied behavior analytic approach during the Planning and Placement Team (PPT) process will help parents set goals for their children. ​Be inspired by the loving words of a special needs volunteer and advocate as she reflects on the value and beauty of all people. Learn ways to create a gentle balance for an autistic child in a world filled with perfectionism and criticism. ​Discover great ways to bridge the gap between a therapy session and everyday life, as well as reduce anxiety and sensory overload. ​Learn how a young man with autism transitioned to driving to and from work on his own after years of training and experience. Find out how you can easily prepare a child with autism for air travel; includes sample social story. ​Read a special interview with an author and educator who was inspired by her son with autism to work as a family coach and empower families of children with exceptional needs. What's New on the Bookshelf? ​​In this unique manual, Amy Eleftheriades discusses the nature and benefits of logical thinking, nuances of language and communication in social situations, and the intricacies of social etiquette and peer interaction. Discover the advantages taking a year off after high school can have for an adult child with autism from a speech-language pathologist and veteran educator of children with autism and learning differences. ​Judit Rick provides a relatable account of one family’s autism journey. It is full of useful ideas that can benefit many families. Meet a young woman with autism who credits her connection to music in making her feel understood and special. Meet the accessibility and inclusion coordinator at Space Center Houston who designed special programs and events to provide quality learning experiences for all guests with special needs. Get insight from an expert from the adaptive swim program Swim Angelfish on why a child with autism behaves in certain ways while in the pool. ​What's New on the Bookshelf? ​Susannah Hoffman provides step-by-step instructions paired with photos of children doing yoga with special notes for parents on the benefits each pose brings and how to stay safe during practice. Find out from a financial planner how technology and policy are changing to help parent and child overcome many long-term challenges. Parents of children with autism spend a great deal of time assessing behaviors. They constantly monitor their child’s development, research therapies, and seek professional advice. It seems like everyone forms an opinion about the child. But what about the child—how does he/she feel about the diagnosis? Too often children with special needs develop senses of self from their surroundings and thereby judge themselves harshly. Tali Berman, an autism specialist and award-winning author, agrees it’s essential to help children with special needs develop an overall positive sense of self. Not only does healthy self-esteem boost confidence and happiness, but it also allows children to be more receptive to learning challenging skills. For professional advice, take a look at Tali’s piece, Self-Esteem and Autism: Powerful Strategies You Need to Know, as she shares five strategies to help the child develop an important sense of self. We also asked author Rachel Jackson as the mother of two young boys to share her thoughts with us. In her piece, It’s Okay to Be Me – Ways to Build Self-Esteem for Children on the Spectrum, Rachel shares how she has tried to create a balance for her children in a world filled with perfectionism and criticism. She explains how hypersensitivity has a huge impact on self-esteem and what parents and professionals can do to help young people. For additional insight into self-acceptance, take a look at an inspiring piece by middle-school teacher and motivational speaker David Petrovic, BA, called Accepting Help Can Be Hard, But So Important. Diagnosed with autism as a toddler, David says once he was able to learn his strengths and weaknesses and rediscover his faith, he was finally able to start loving and valuing himself—and he could reach his goals. Speaking of times of uncertainty, do the holidays become a stressful time for the household? The dread of receiving invitations for special events, not knowing how the family will handle the added pressure. This is a common issue for special needs families as not all of the people you meet are as inclusive and understanding as you need them to be. We understand how challenging this time of the year can be, so we asked APM columnist Sarah Kupferschmidt, MA, BCBA, to provide her expert advice. In her piece, Simple Ways to Cut the Holiday Stress For Kids With Autism, she offers simple ways you can help buffer the tension, from using mindfulness techniques and teaching skills to creating a quiet space and developing a safety plan. Finding the resources you need to help a child with autism can be a challenge — that’s why we make such an effort to respond to our readers’ needs. This month our writers have tackled several valuable topics such as ways you can better connect with a child with autism and steps you can take to ensure a student receives the education he/she deserves. For families in search of information on how to prepare for life after high school, Pamela Quarterman, MMSc, CCC-SLP, has provided a piece, The Benefits of Taking Gap Year With Autism, on the advantages of taking a gap year. Pamela believes many young people with autism can reach an independent, purposeful life, and taking this time may be the perfect bridge to reaching goals. We often receive requests for practical solutions for gaining skills with autism. 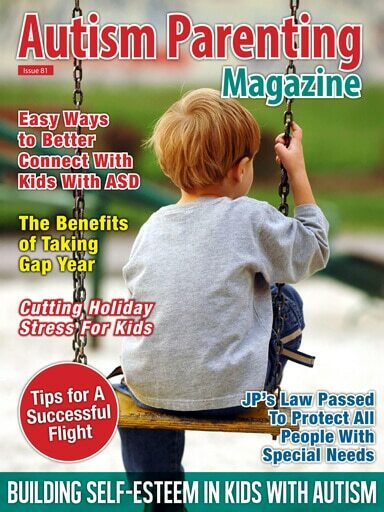 This month, Ron Malcolm, EdD, has provided a piece, Amazing Tips for A Successful Flight With A Child With Autism, on how you can easily prepare a child for air travel, which includes a sample social story you can adjust to a child’s needs. Sharon Link, PhD, and James TG Link, mother and son, have collaborated on a unique piece on how to best prepare someone with autism to drive. After years of training, practice, and parental support, James is now able to drive to and from work on his own, a huge step toward independence. Take a look at their piece, How to Best Prepare a Child to Drive, as both mother and son share what helped him get ready for the open road. For additional inspiration, we have a unique piece called JP’s Law Passed To Protect All People With Special Needs written by Pam Mines. Pam is the remarkable autism mom who led the legislation to establish JP’s Law in Virginia and established a special identification card that helps law enforcement understand when they are engaging with someone with special needs. Her goal is to make this a national movement to protect all people with special needs. 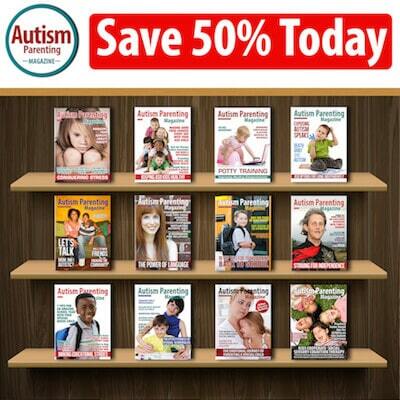 We are thrilled to share some terrific news with our community — Autism Parenting Magazine was ranked fifth for Top 20 Parenting Magazines and Ezines to Follow In 2018 from thousands of parenting magazines on the web. We are honored to share this award with our many contributors, including you, our devoted readers. Together we form an outstanding autism community. Be sure to check out our Autism Parenting Magazine Facebook page as well as our community page called Autism Support Groups for Families that provides a place to share experiences and advice, and to connect. As always, everyone is invited.